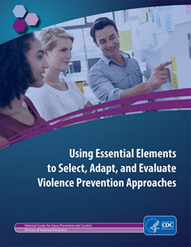 Today, the CDC released Using Essential Elements to Select, Adapt, and Evaluate Violence Prevention Approaches to help state and local partners with the implementation of evidence-based prevention approaches. Because each setting for violence prevention strategies is unique, practitioners must make decisions about how to balance delivering prevention approaches as intended with the reality of their local context. The Division of Violence Preventiondeveloped this guidance document to support a step of the implementation process. How can the document be used? Apply this knowledge to effectively select, deliver, adapt and evaluate approaches. Although this guidance was designed with evidence-based approaches in mind, it may also be useful for approaches supported by promising or emerging evidence. To learn more, join CDC and PreventConnect for a web conference Monday, August 28 at 11am PST/2pm EST. For more information and to register, click here.